The temperatures have been in the 90's. It is the perfect weather to stay indoors and stamp. And the perfect time to start making Christmas cards. 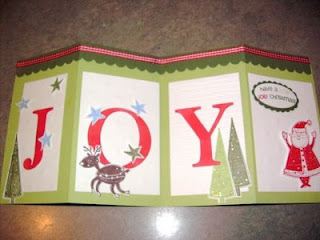 This coming Sunday, July 18Th I'm having the 1st Christmas card class. These particular cards are more than the normal 51/2 X 81/2 piece of card stock folded. I'm offering this class so that you will have time in this hot weather to make several of these "WOW" cards if you choose. The above card is one of the ones you will be making on Sunday. Today, starts the $85.00 promotion to be a demonstrator. This is one of the best times to join. 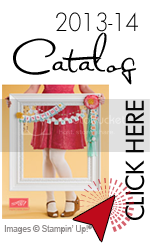 Brand new catalog, holiday promotions and a great time of the year to utilize your creativity. All of my downlines are able to attend my classes FREE for a year. There is also a monthly downline meeting at my home to share information and ideas. Stampin'Up has wonderful products coming out this year. I'm really excited and would enjoy talking to you about what being a demonstrator can offer you.